Three Civil War veterans team up with a train robber's widow to recover a cool half-million in hidden gold. The widow (Ann-Margaret), the kind who "sticks out in all the right places," wants to clear her husband's name. 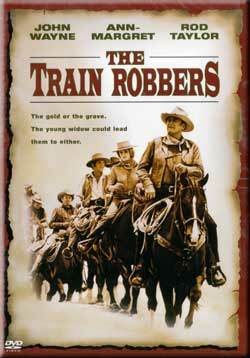 The three friends (John Wayne, Rod Taylor, Ben Johnson) want to aid her and collect a $50,000 reward. But the dead man's ex-partners just want the gold -- and will kill to get it. The Train Robbers is a rollicking caper from writer/director Burt Kennedy, a specialist in Westerns with a comic touch (The Rounders, Support Your Local Sheriff). Here he sets a mood of amiable adventure among colorful characters, not stinting on the two-fisted action that's part of all the best Wayne Westerns. Fred M Pohl on 2009-12-31 04:44:27. This was a good movie and I'm still a fan John Wayne. I saw Ann Margaret when I was deployed to Vietnam when Bob Hope came and visited the troops in Dong Tam circa Christmastime 1968 and Ann Margaret refers to Vietnam Vets as Her Gentlemen. I'm among the many railfans who are also Vietnam Vets.